My passion is to help and encourage my patients, of all ages, to become as healthy as possible physically, emotionally, mentally, and spiritually. For example, I am ready and willing to meet the challenge of preventing or reducing your risk for illnesses such as heart disease, but I’m also intent on making sure your “heart” is right spiritually and emotionally. See "Is Your Heart Healthy?" for more information. I received my medical degree from Wayne State University School of Medicine in 1994. I then completed Family Practice residency training at Ventura County Medical Center in 1997 and I am board certified in Family Practice. Since finishing residency in Family Practice it has been my privilege to serve the people of the remote, war torn and developing nation of Tajikistan for eight years until 2007. Living and working in a foreign country with my family was a huge challenge, but also a very enriching experience. While practicing medicine in Tajikistan, I interacted with some of the country’s top doctors and politicians to develop curriculum and clinical practice guidelines. After moving back to Ventura County, I partnered with my long time friend Dr. James Hermann in November 2007, and we formed Wellspring Family Medical Group in January 2008. Some of my interests include marriage and family counseling, conflict resolution, mentoring, history, trekking in Central Asia (or wherever), rock climbing, swimming, water polo, and playing guitar. I am blessed with a wonderful wife and two fantastic sons. How humbling it is to consider the task of tending to a person’s most intimate concerns and sufferings. 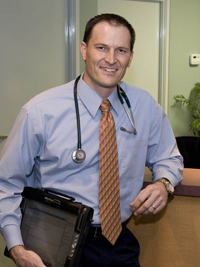 I have greatly enjoyed my studies in the art and science of Medicine, having completed my medical degree at the Medical College of Wisconsin and a Family Practice residency at the Ventura County Medical Center. Once I completed this, I felt as though my training began in earnest as I sat down in emergency department bays and clinic exam rooms – talking with patients and listening to their symptoms, their past histories, and their fears. A prominent professor of physiology once noted, “In the sick room, ten cents worth of human understanding equals ten dollars worth of medical science.” I have found that taking some time to listen to my patients has frequently been the key to gaining the insights and understanding I needed to make the correct diagnosis of their problems and provide sound treatment recommendations. As a scientist and healer, my aim is to succeed in relieving virtually all of the problems that trouble my patients. Ultimately though, my goal is not to simply diagnose a condition and give a patient a list of tasks to complete until the next office visit. Rather, by entering into a partnership with my patients, I can help them establish and reach their own health and well-being objectives. I understand that the patient is the C.E.O. of his or her healthcare and knows far beyond anyone else what is important to their lifestyle and sense of self. I feel I will best serve my patients by providing them with the right tools and encouragement to assist them in this very private task of tending to their functional quality of life and to their physical, mental, emotional and spiritual well-being. Outside my work as a physician, my main interests in life include: family fun time with my wife and children, down-hill skiing at Mammoth, backpacking and rock climbing in the Sierras, and training bonsai trees in my backyard.